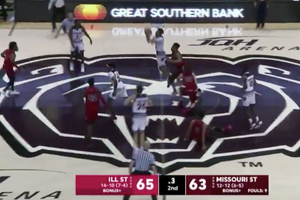 Down two with seven seconds to play, Missouri State needed a miracle to win. What happened next is one of the most chaotic things you'll ever see on a basketball court. Bernhard Langer was sufficient from tee to green, but his short game excelled in winning the Oasis Championship. Saving par is all about pitching it close. Jon Rahm shares his best tips to help you get up and down more often. Check out the latest installment of Vijay Singh's now-viral workout videos...featuring a secret weapon. How Amy Bockerstette, a golfer with Down Syndrome, navigated three shots at the Waste Management Phoenix Open can be instructive for everyone. Here's all the equipment used by Celine Boutier, en route to winning the inaugural joint men's and women's IPS Handa Vic Open last weekend. Phil Mickelson, Tommy Fleetwood and others made some equipment changes at the AT&T Pebble Beach Pro Am. Golf twitter couldn't get enough of Jim Nantz and Nick Faldo's hilarious segment with Clint Eastwood at the Pebble Beach Pro-Am on Sunday. Phil Mickelson won his third AT&T Pebble Beach Pro-Am with a split set of irons comprised of four different models. The downside to being so good? Anything less than a title is a disappointment. From drama in the dark at Pebble Beach to Phil Mickelson to one of the best shots on tour this season, what you missed in golf.